You can call it a miracle or prayers answered. Well, we kind of describing what has happened as a mixture of both. We are a normal, humble family with no cables plus no acquaintances in the corporate world, the Malaysian corporates to be exact, no titles attached to our names (well Malaysians have a penchant for this), meager living incomes plus many more under privileges as you name it. Now, coming to the reason for my writing this article, how in the world could we obliged a request by a five year old grandson, a train enthusiast, for a visit to a highly strictly security LRT depot? Its just impossible, says a song. We du'a for a miracle. 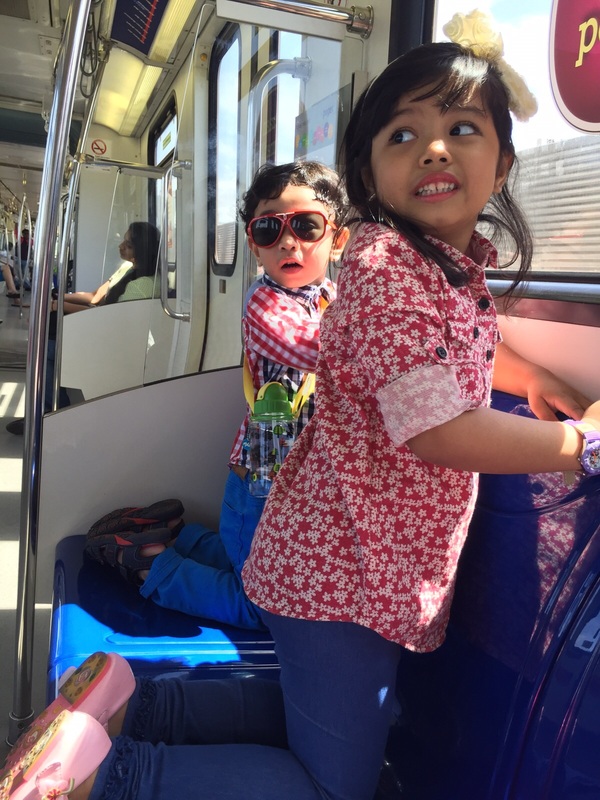 Wan Ahmad Daiyan's love story with the Light Rapid Transport (LRT) to be exact the Kelana Jaya Lines before this is known as the Putra Lines started when he was a baby. Well, at what age a child starts to be aware of his surroundings? That could be the first time Daiyan fell in love with the LRT. This LRT services has been here long before Wan Ahmad Daiyan (born 2012). This will specifically explained why LRT has become part of Daiyan's daily routine, living in metropolitan Kuala Lumpur where LRT is fast becoming an important means of transport for the city dwellers. As stated above, Daiyan's LRT love story started when he was a tiny baby. Every weekdays, his paternal grandparents looked after him while my daughter and husband were at work. 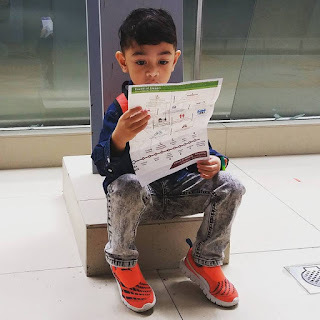 His paternal grandparents live on the 12th floor of a condominium, overlooking an LRT station, The University Station, now known as University KL Gateway Station. His paternal grandparents remember how everyday baby Daiyan insisted on looking down at the LRT station. He was extremely excited looking at the 'giant caterpillar' weaving down the rail tracks, in and out the station down below. Nothing pleases Daiyan more than watching this giant caterpillars. Well, to pacify him from his babyish tantrum, just step on the balcony and he would stop crying and smile. Now, that was Daiyan as a spectator. Now, he was then old enough to take a ride on his beloved caterpillar? 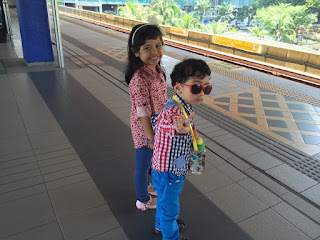 In fact almost every other weekends when his parents were free, the little family will go for the LRT ride. Daiyan never had enough of the rides even today. He loved to sit (as a baby) and stand since he is tall enough, near the front window, for him to have a good view of the rail tracks and probably be the first to spot the next stations. He would rant out the stations' names, imitating the train's announcement. His first baby words are Trains, Stations, and Lights, and of course tunnels. Don't be surprised he memorised all the names when he was two years old. The thrill of riding trains continued at home. He imitated the LRT sounds. It was irritating and deafening when Daiyan makes the screeching sounds of the trains. He explained that the trains screamed when it entered the dark tunnels. The louder the train screamed the faster it ran on the tracks. Daiyan and his LRT were inseparable. At home too, LRT will always be on his mind. Besides him sounding like a train, YouTube LRT videos were his constant companion. Never a bore to him, videos showing trains moving along tracks, stopping at the stations, doors opening and closing and moves again to the next station, intercepting only by announcements, heralding names of the approaching stations. We easily dozed off while accompanying him watching these videos. Yet he became more alert; besotted by every trains movement, counting the seconds and minutes taken by each movements, and was aware of physical appearance of each train's carriage. For Daiyan no trains carriages are similar, he could spot the difference! Since at a tender age he prefered to watch LRT You Tube to cartoons show except Upin and Ipin, of course. In the begining his parents helped him to find the LRT you tube videos, as he got older and had acquired the needed skills, he find the webpages himself. When he was four he typed the letters LRT on the google search. Talking about Daiyan's learning process, that is recognising alphabets, his passion for LRT You Tubes, really made him a fast learner. He can read the Train lines Map! How did he manage to point the stations names on the maps and said out the names? When the Kelana Jaya Line expanded its services to more stations, he easily remembered all the 37 stations and prattled on in the right order! LRT is a wonder to Daiyan. For him, a this non driver train is fantastic. He wanted to know more. Non of our family members works as a railway engineer. We could not answer his countless questions and You tube videos does not sufficed his curiousity. There were no videos on how the local trains are being taken care, repair etc. He was not interested on videos of other LRT especially overseas LRT and their depots. He wanted his LRT at the depot at Lembah Subang. Probably Daiyan is influenced by Thomas the Train and friends adventures. At the end of the day, Thomas with Percy and other friends will relate their daily adventures at work pulling their carriages along the rail tracks. For him, his LRT trains did the same things. We remember, whenever our LRT ride passed the Lembah Subang Station he would make us look down to catch a glimpse of the resting trains. He kept on pestering his parents for a visit to the LRT depot. This was definitely not a normal request Not a small boy's demand for a new toy! Daiyan's love for LRT is not a passing whim. It is a passion which needed tbe fulfilled. The whole family realised and recognised his virtues. We do not want to disappoint and dampened his spirit and killed his love for trains. We had tried our best to accomodate his request by enquiring around close friends who happened to know someone who is working with any of the train lines. But we were told that, it is impossible because even staff members are not allowed into the depot. We prayed silently. It is not our wish to dampen a young mind. Hidayah from the Most High Mighty. On Daiyan's fifth birthday celebration at his Kindergarten, his parents thought of a LRT birthday cake. A search on instagram, brought them to a baker who promised to create an awesome LRT birthday cake. An awesome LRT birthday! Daiyan was over the moon. 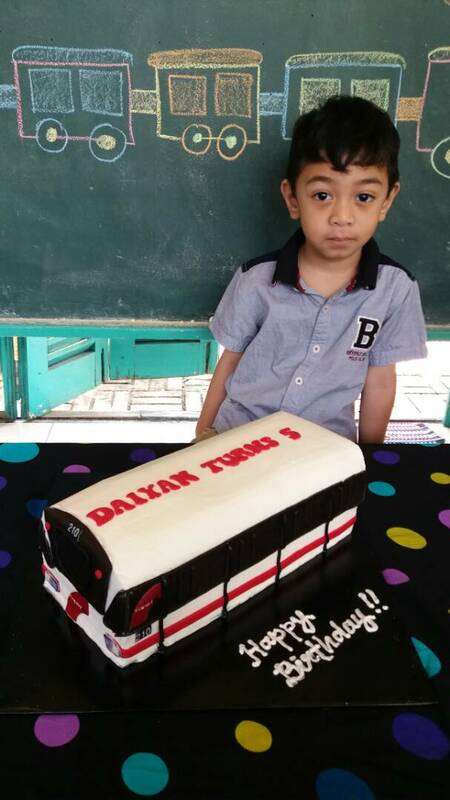 His parents took a photo of smiling Daiyan with his lrt birthday cake. Hidayah from the Most Beneficient. His aunt, Ain, my other daughter tweeted it and tagged it to the Group CEO of Prasarana...Daiyan and his birthday was warmly received by the Group CEO and the RapidKL company. to be continued Part II..
Tokteh is more excited than Daiyan. To see Daiyan's wish granted is God sent. Lve yoy very much my intelligent and adorable grand nephew! Love the video too. Mcm pertama kali jumpa kekasih, malu-malu kucing...aiwaaah. pasal Daiyan soghe..impossible pun doa biar jadi possible..insha Allah!